Home » Uncategorized » Dierks Bentley did WHAT? True to tradition, Dierks Bentley completed his annual lake jump. This year he pulled off something a little bit different. Dierks was in town for a NYE show at Hard Rock Live in Orlando. He tweeted, “no lake today, had to improvise”. The lake he used last year had an alligator warning. (pssst… there is one on every body of water in FL). That didn’t stop him from keeping tradition alive. 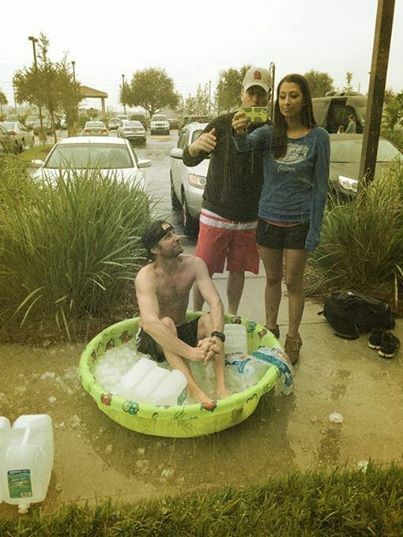 Orlando based K92 morning hosts AJ and Ashley helped him devise a good plan – a baby pool filled with ice. He’s certainly a good sport and made an impression on the hosts as well. Ashley tweeted “more artists should take notes from Dierks Bentley. The most down to earth, easy going person Ive met in a long time. Love it.” We agree with you Ashley. Anyone willing to jump in an ice filled baby pool, banjo in tow, is ok in our book.